With the HBZ Signature Business Debit Card you can always expect the best. This internationally recognized Visa premium card is accepted at over 29 million merchant outlets and 1.5 million ATMs in more than 200 countries and territories worldwide. 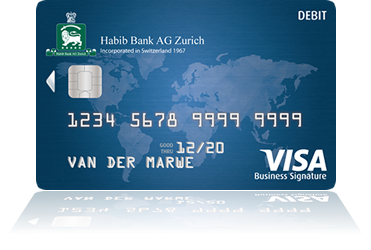 Enjoy more with HBZ Visa Signature Business Debit card. Unlimited, complimentary access for card holders. Additional guests are charged at US$27 per visit per guest. Website to view card visit history and program details. No registration required to activate the Visa Signature card - Accompanying guest/s charged US$27 per visit per guest directly onto the Visa Signature card. For more information, visit www.loungekey.com/visasignaturemena. Discounts and Privileges at Avis for Visa Signature cardholders. Avis Car Rental operates one of the world’s best-known car rental brands with a truly global footprint. The 24-hour concierge provides a personal service to Infinite cardholders, taking care of all the details so they can simply take their seats and enjoy. Booking tables, including those that are hard-to-get. Travel arrangements: booking flights, hotels, car rental, hotel transfers, tourist advice. Shopping recommendations, sourcing a product. Arranging a special gift, sending flowers And much more! For more information, call: +9714 361 1234. Use your Visa Signature card to pay for your travel and you will receive complimentary travel insurance in respect of that trip. For visa application purposes and evidence of cover, please Download your Certificate of Insurance here. Use your Visa Signature card to pay for your purchases and items purchased may be eligible for the benefit of Extended Warranty. This benefit automatically doubles the original manufacturer’s warranty for selected items purchased with your Visa Signature card. GCAS exists to provide our Visa Platinum cardholders with the world-class customer service that they deserve. Providing essential services when they need it most, GCAS adds genuine value to the Visa Signature card holder when they travel. For more information on what GCAS can offer, call +971 4 361 1234.